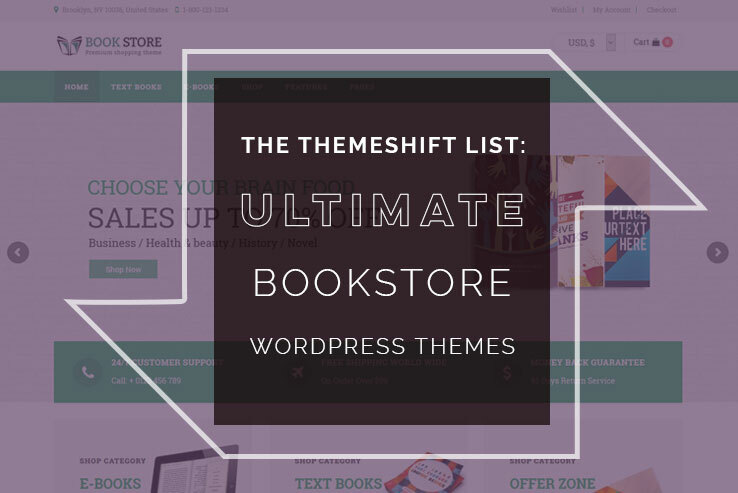 So what makes a theme just right for an author, book collector, or burgeoning publisher? Well, for the online bookstore, we like to see a dynamic frontpage with categories of your latest books – potentially in a filterable search format. If you are selling an eBook, a front-and-center “About” section and 3-or-less clicks to make a purchase are both top priorities. Of course, the typical attributes of a modern website are always a prerequisite for any new company just coming online. That means, keep an eye out for WooCommerce integration, responsiveness, filterable library, built-in SEO, and localization. If you are in the market for a website that can sort and sell your books online, this roundup is for you. If you are looking for a way to market an eBook series, this roundup is for you. If you are an up-and-coming indie publisher – read on. Please let us know in the comments below if we have overlooked a template that you’ve had success with. Bookshelf is a solution for online stores selling books, audio books, movies, and different types of services. 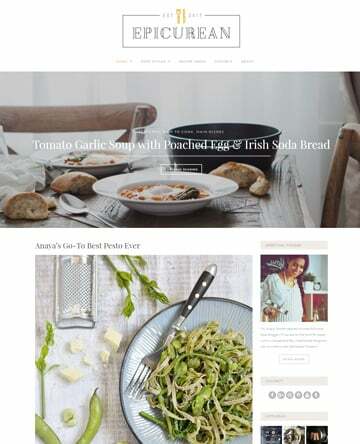 The theme is WooCommerce and WPML-ready. There are several variants of demos you can install in one click. The customization opportunities are endless and don’t require any coding skills. Visual Composer plugin integration allows you to edit your pages in the drag-and-drop mode. 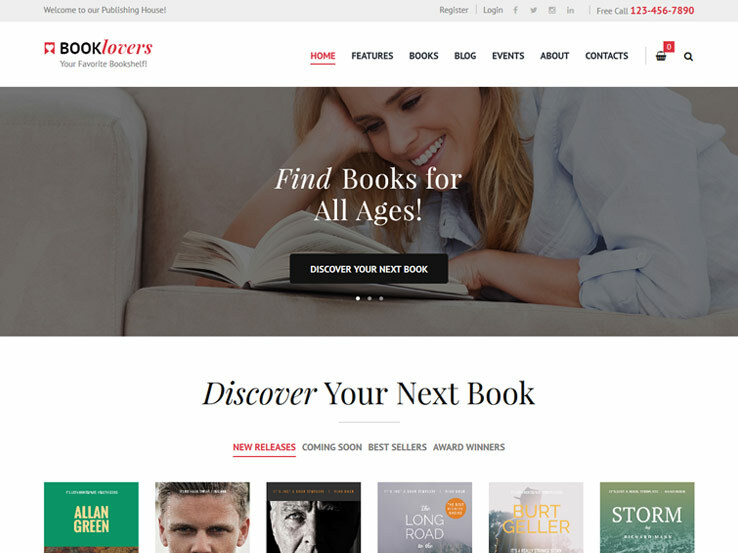 Booklovers, by Ancora Themes, is a complete solution for an online book retailer, publisher, or subscription-based service. It’s clean and colorful, with clearly defined content blocks spanning the frontpage so you can feature customer favorites, top selling novels, articles on latest publications, and more. Premium plugins like WooCommerce, Visual Composer, Essential Grid and Revolution Slider all integrate flawlessly with Booklovers theme. Expect excellent displays on iPhones, mobile, and tablets, along with a one-click demo install to get your site off the ground in seconds. 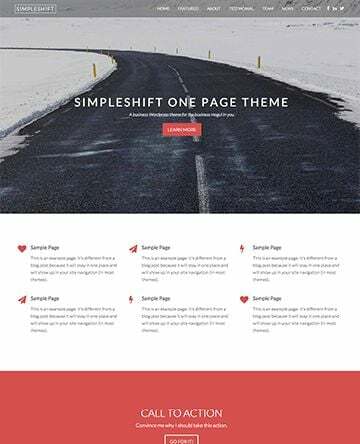 This theme is exceptionally versatile in how you can manipulate the “look and feel” of your website. 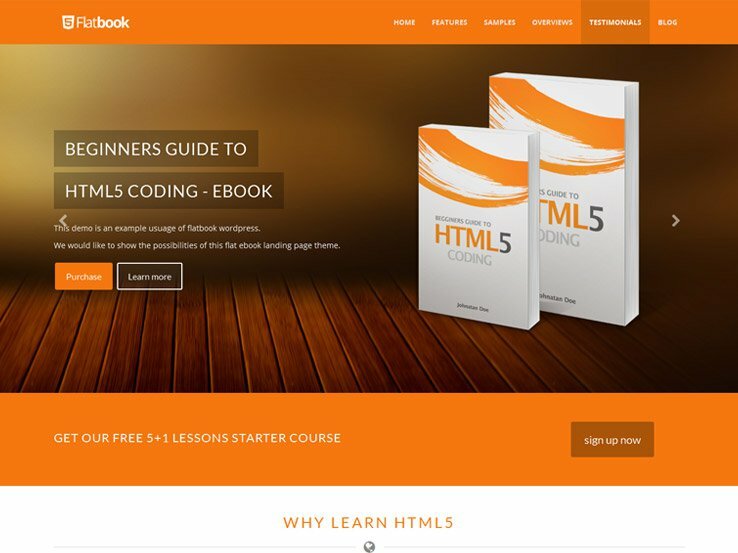 Booklovers comes with four premade homepage layouts, and the Visual Composer lets you drag-and-drop content anywhere you’d like. This means you don’t have to know a line of code to build your site – just build it out and start selling your publications! From Templatic comes Publisher, a simple template geared toward professional writers and media publishers. 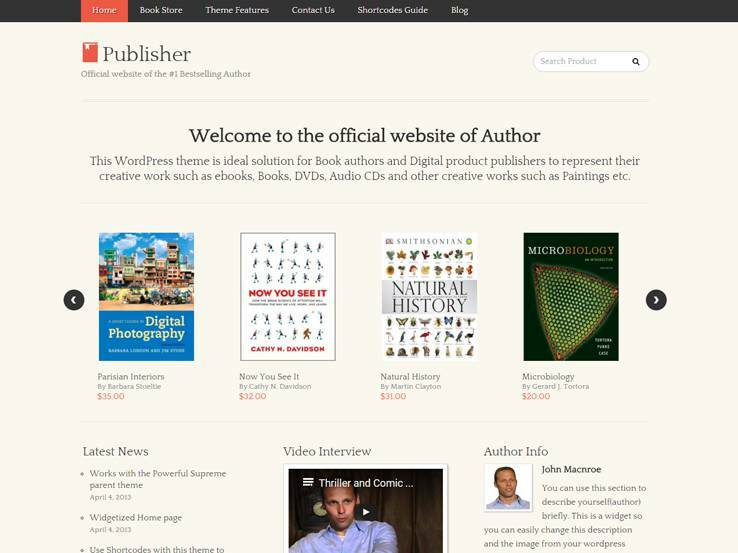 Publisher is a portfolio site of sorts, allowing authors to post an intro statement about their work and showcase featured books, DVDs, art, and other media-rich items on the frontpage. A video widget area allows you to post recent interviews or audio clips, while an “About” section lets you introduce yourself and your work to your viewers. Publisher ships with a full blog to connect with your users and keep them in the loop with your latest goings-ons. The popular Digital Downloads plugin is packaged with the theme, making it super simple to sell digital products like eBooks or music. The theme author’s Tevolution plugin also comes with the theme files, which enables custom post types, multiple payment gateways, and enhanced customization options. 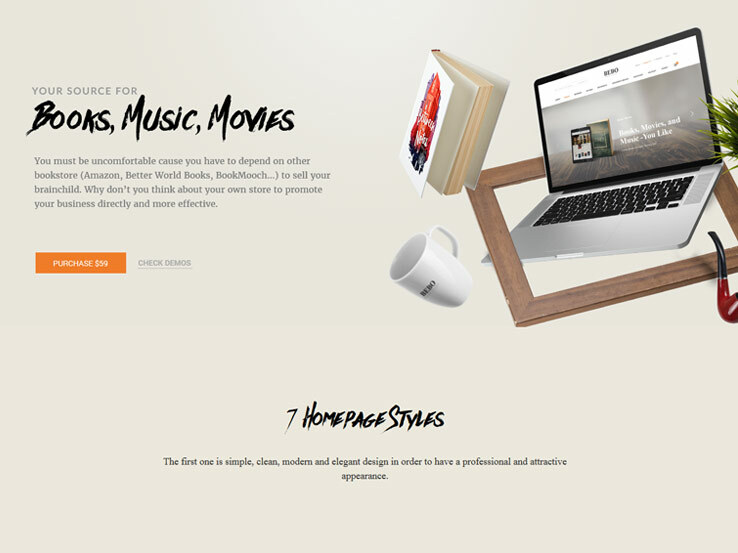 Aurum, from Laborator, is a beautifully modern web theme intended for a variety of e-commerce sellers, including bookstores. It offers a crisp, smart design that combines both form and function to create a fantastic user experience that you, as the website builder, will appreciate. In addition to the fun “Bestsellers” section, we also love the “Featured Author” call-out, which also includes the author’s top publications. A promotional area for discounts or free shipping can be placed anywhere on the page with the help of the drag-and-drop page builder. With WooCommerce integration, you can sell just about anything online. And for a bookstore, this is no different. Take a look at the “Books” menu item to see how nicely products are displayed – and click on a book image or title to drill down to the book details page. Related products are viewed in the widget area underneath the item details, so your users will keep clicking around your site to find new publications. 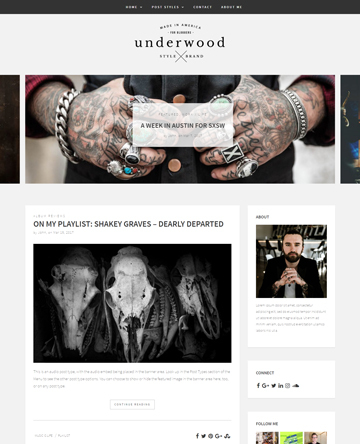 Aurum is an excellent theme with great potential and is well worth taking a closer look at. 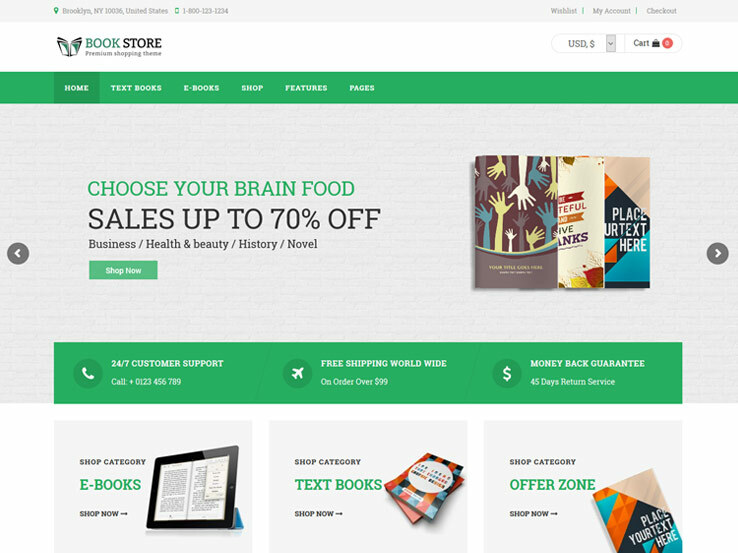 The Book Store theme, sold by Acmee on ThemeForest, is one that exemplifies smart, modern web design concepts. It pairs a friendly user interface with well-established WordPress tools like Slider Revolution plugin to produce an interactive, dynamic website that your viewers will love. 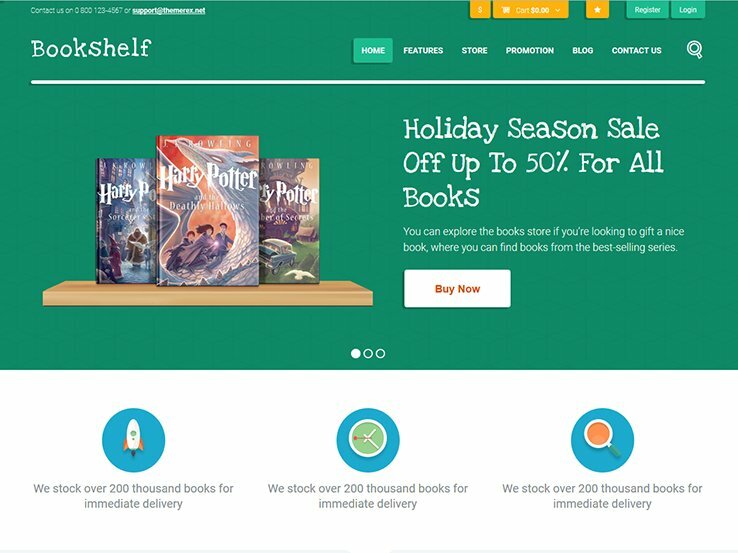 The full-screen banner is engaging, and the Visual Composer page builder lets you alter the content areas so they fit your site’s needs to a T.
A mega menu and one-click install further help you organize your bookstore, while the five homepage layouts give you the versatility you need in a web page. If the green accent color doesn’t suit your branding, you can customize it, along with all the typography on the site. 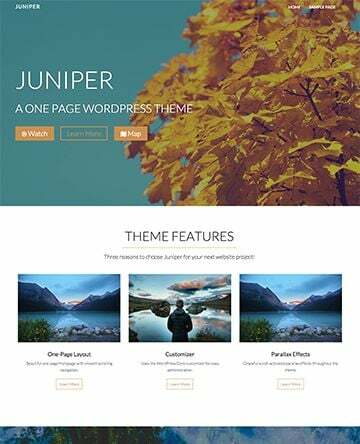 This theme would be a perfect fit for any media publisher, so make sure to give it a review. 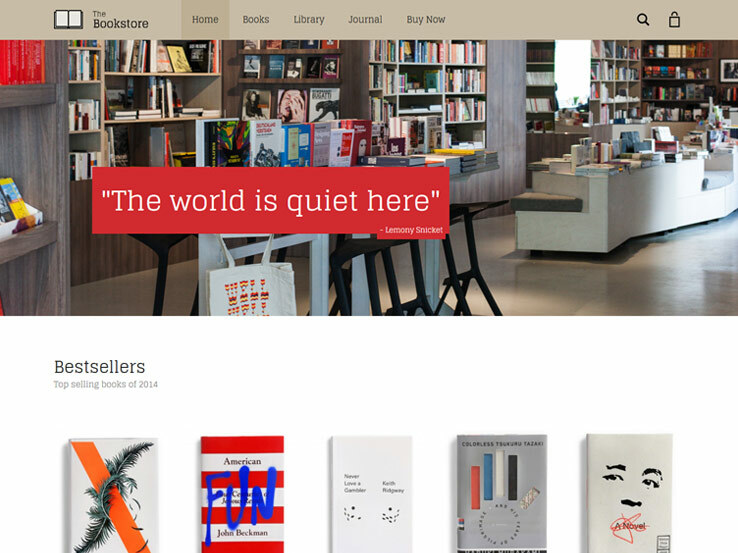 From Beau Themes comes Bebo, a flexible theme for booksellers featuring seven different homepage layouts. Each style is quite unique and incorporates dynamic content like parallax scroll effects and Slider Revolution banners. The header area includes a full shopping cart management area, hidden drop-down menu, large search box and logo area – and these options can change depending on your shop’s specific needs. WooCommerce support lets users compare, wishlist and view in “Quickview” mode for an enhanced shopping experience. When we look at Bebo in terms of functionality, it ranks high on the user engagement front. Bebo is built on the Bootstrap framework, so responsiveness is automated. CSS3 animations provide an even more vibrant user experience. In the design department, the theme has ample white space that highlights your products. A full blog keeps readers in-the-know, and shortcodes and filterable product categories help users find exactly the book they’re looking for. This theme would also work well if selling digital media like CDs, DVDs or MP3 files. Marketed as both a bookstore and fashion theme, Papirus is sure to satisfy the bookworm in you. Let the interactive frontpage sliders sell your top featured items with the help of the Revolution Slider plugin. Scroll down the page to view the engaging post overlay effects in the “New Arrivals” and “Best Sellers” sections – we couldn’t help but click through the site with these dynamic features! Users can search via a filterable search form to find just the book they were looking for, so your products don’t just sit on the shelf. Premade page layouts come with the theme and include a one-page template, multiple homepages, Testimonials, Our Team, Services, and FAQ pages. Along with a stellar minimal layout that marries stark lines with rich sans-serif typography, Papirus delivers on plugin integration. Visual Composer, WooCommerce, Mega Menu and custom Tokokoo shortcodes are just a few of the bonus items that come with the template. Versatility and flexibility are part of what makes Bookshelf a digital gem. With five homepage layouts, you can find just the right look for your store. Get ready to be blown away with the large-scale frontpage carousel, powered by Revolution Slider. This is not your typical frontpage banner – it spans the entire height of the header as well, so your navigation, logo, and cart management icons have a constantly changing background that helps entice the reader from the get-go. One interesting feature in Bookshelf is a Promotions page layout, which includes a user rating submissions system and multiple widget areas. Popular plugins for shopping cart management, page composer, and other features come with the theme, giving you more control when building pages and integrating content. A comprehensive blog layout gives you a place to showcase new authors, works of fiction or favorite indie bookstores around the globe. This theme also supports native post formats and translation to other languages. Have an eBook and just aren’t sure how to market it? Take a gander at Flatbook by Erik Tailor. Bold colors, parallax animations, and full-width content rows give you ample space to highlight your latest romance novel or inspirational work. 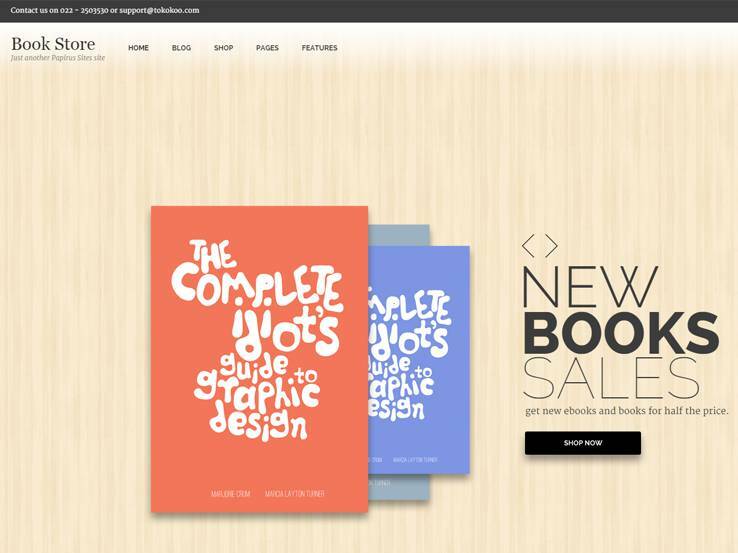 Three focused homepage layouts let you sell your eBook in exactly the way you want. Retina support ensures that Apple devices deliver sharp, crisp images, while the embedded page builder helps you further customize your eBook store. If you are looking for a book sales landing page, Flatbook is flexible enough to accommodate that, too. If you’re more of a book geek than a computer nerd, the one-click demo content install option will help you out – just load the theme’s default content and replace it with your own. Custom post formats are available on the blog for featuring author interviews or favorite quotes on writing. And, most likely, you will find that Flatbook gives you more features than you will ever need.